Prices in EUR per night. The villas are situated at the foot of the little village Lefktro, that lies 500 meters from Stoupa (the bakery) and 900 meters from the central beach of Stoupa. 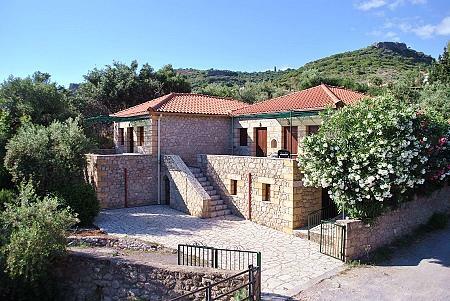 There are two villas: one of 60 square meters (this is the one on the left of the picture) which is called Armonia 1, and one of 80 square meters, Armonia 2. Armonia 1 has one bedroom with two single beds and ceiling-fan, a large living room with open kitchen, and with two stone sofa-beds, so this villa can be used for up to 4 persons. Armonia 2 has two bedrooms with two single beds in each and ceiling-fans. Also here the living room has an open kitchen. A third bed can be put in one of the bedrooms so this villa is suitable for up to 5 persons. Both villas are built with natural stone, the colour of sand, which fits very well into the environment. Also inside the villas are some walls with natural stone. The villas are air conditioned. The verandas of each are big and the sea can be seen from there. Around the villas is a wall of the same stone and there is space enough for two cars to be parked inside. They are along a very quiet little road, with olive groves all around where children can play. Underneath the villas is a small cellar - storage-room for the owner.